Kurt Sutter, the creator of FX’s Sons of Anarchy, has asked the cable channel to order an extra episode for this season. Apparently, he feels like he needs the additional installment to appropriately wrap up the current season’s storylines. Sons of Anarchy remains FX’s most successful TV series so they were understandably happy to get another episode. The new fourth season finale of Sons of Anarchy will air on December 6th. The TV show has already been renewed for season five. LOS ANGELES, November 7, 2011 – FX has ordered an extra episode of Sons of Anarchy that will extend the current fourth season to 14 episodes with the series finale now airing on Tuesday, December 6 at 10:00 PM ET/PT, announced Nick Grad, Executive Vice President of Original Programming, FX. Four seasons in, Sons of Anarchy is recording its highest-rated season yet, delivering 5.45 million Total Viewers and 3.71 million Adults 18-49, respective gains of +23% and +20%. On a weekly multi-telecast basis, Sons is delivering 8.51 million Total Viewers and 5.71 million Adults 18-49. The series stars Charlie Hunnam, Katey Sagal, Ron Perlman, Maggie Siff, Kim Coates, Mark Boone Junior, Ryan Hurst, Tommy Flanagan, Theo Rossi, Dayton Callie and William Lucking. Sagal won the 2011 Golden Globe(R) award for Best Actress in a TV Series – Drama for her performance last season. Sons of Anarchy was created by Kurt Sutter who also serves as Executive Producer along with John Linson, Art Linson and Paris Barclay. The series is produced by FX Productions and Fox 21. What do you think? Is this season one of the show’s best? What do you like or dislike about it so far? More about: Sons of Anarchy, Sons of Anarchy: canceled or renewed? 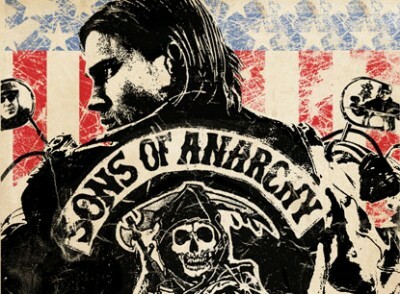 Sons of Anarchy: Is a New FX Series on the Way? Probably my fav show after Breaking Bad so this is great news! Tonight was amazing. Does anyone know the rap song that was playing when the Mayans and samcro got into the shoot out with the black guys. It was a great song. Thanks. Thank you so much. I was trying to find that rap song too! Been watching since day 1, have to say this year is one of the best yet and was wondering how they were going to close sooo many open issues this year. You KNOW it’s a good show when they have to have an extra episode to wrap up the season. I don’t think I’ve ever heard of this happening before.